Outlandish Observations: Update on the Friday Fun Facts Contest! Thanks to everyone who's sent in entries for my Friday Fun Facts Contest so far! The initial response was very positive, but I've received no new entries in a few days. I don't know whether that means nobody else wants to participate, or people have forgotten about it, or it's a busy time of year and everybody's waiting until the last minute -- but I thought I'd post this reminder, just in case. The prize is an autographed copy of WRITTEN IN MY OWN HEART'S BLOOD! 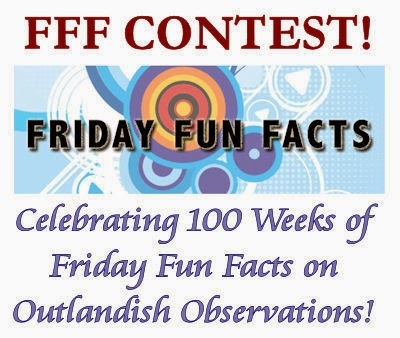 All you have to do is send an email to contest@outlandishobservations.com, with the subject "FFF Contest", listing 5 of your favorite Friday Fun Facts. And keep in mind that I'm looking for specific items from the list, not broad categories. The contest ends on Saturday, April 5, at midnight Eastern Time. For more information, see the contest announcement here. Please pass the word to anyone else you know who may be interested. Thanks!